The Le Vian name has been associated with the world's finest jewellery since the 15th century and is now worn by Hollywood celebrities and the glitterati. 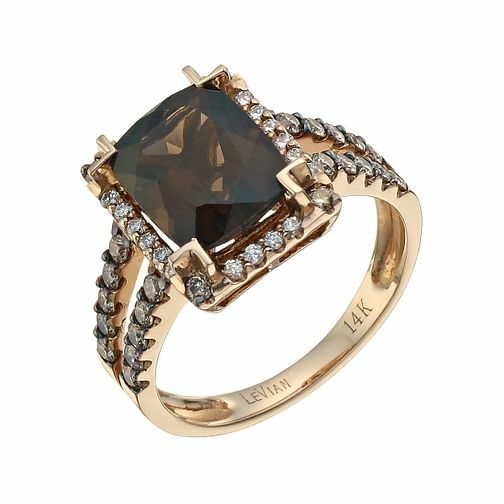 14ct Strawberry Gold diamond and smokey quartz ring. Matching Band: 9759786. Le Vian 14ct Strawberry Gold diamond & quartz ring is rated 4.6 out of 5 by 10. Rated 5 out of 5 by Anonymous from Simply Stunning My first peice of Le Vian, totally in love! Simply beautiful and very special. Rated 5 out of 5 by Anonymous from Stunning Ring My husband got me this ring for my anniversary and I absolutely love it. Lots of compliments all the time. Stunning ring!